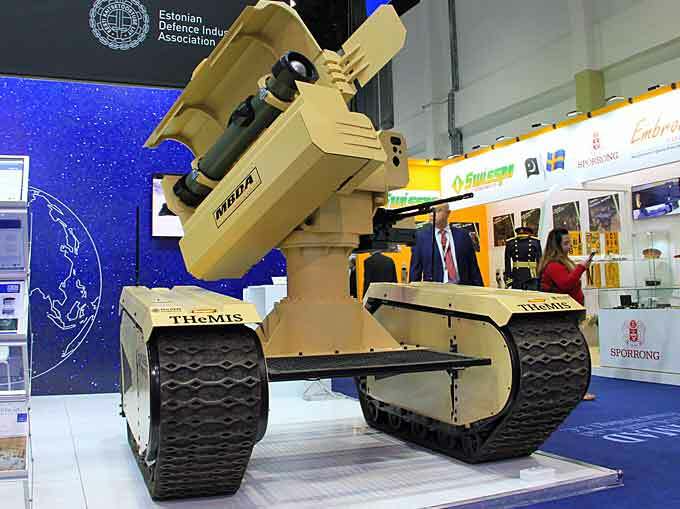 MBDA and Milrem Robotics have announced that the two firms are showcasing the world’s first anti-tank unmanned ground vehicle (UGV) at IDEX 2019, the main defence industry event in the MENA region. The debut of the system’s advanced concept comes eight months after Milrem Robotics and MBDA announced the start of feasibility studies of the system. The joint project integrates the Milrem Robotics THeMIS unmanned ground vehicle with the MBDA IMPACT (Integrated MMP Precision Attack Combat Turret) system fitted with two MMP 5th generation battlefield engagement missiles and a self-defence machine gun. “This combination of two of the most modern technologies in their field is a very good example how robotic warfare systems will bring disruption to the battlefield and make some traditional technologies obsolete,” said Kuldar Väärsi, CEO of Milrem Robotics. “Our unmanned land combat system under study together with MBDA will be very efficient in keeping our troops safe and significantly increasing the capability to fight main battle tanks as well as any other ground target,” Väärsi added.